This book is about selling and delivering your digital products over the Internet. It’s not about selling physical products such as a TV set, a computer or a print book and then delivering them by truck, courier or the postal service. In other words, this book is about selling your digital products and then delivering them directly over the Internet to the purchaser. First of all, it will take you on a tour of the creation process; how to create eBooks, videos and audio books which can be digitally downloaded to the purchaser, once payment has been made. Then, it will show you how to open your own Web site and start selling online. Next, it will show you how to meet the challenge of satisfying the need for instant gratification. Once customers have paid, they want the product NOW...not next month when the snail mailman gets around to delivering it. It’s all fine and dandy to have your Web site up there with the other billion sites, but how are potential customers going to find it? So, this book will show ways to promote your Web site and improve your chances of being discovered through the process of Search Engine Optimization. It will also show you how to use metadata to help in the "discoverability" of your individual titles. Find out how to make sales through resellers. Learn about pricing your digital products and the difference between the agency model and the wholesale model. Finally, it will help you gaze into a digital crystal ball in an attempt to find out what the world will look like a hundred years from now and the immense social disruptions that may occur along the way. This book will help to alert you to some of the challenges and opportunities which lie ahead. Most of all, it will show you how to make money selling your eBooks, streaming videos and audio books online. INTRODUCTION: Stop the World - I Want to Catch Up! Chapter 4: Start Selling Online! 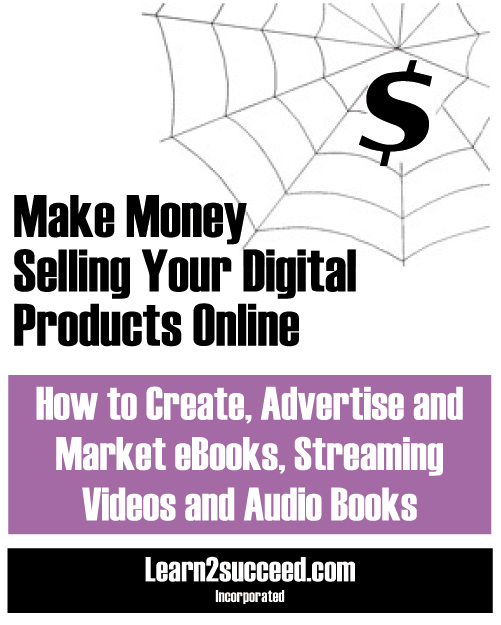 Make Money Selling Your Digital Products Online: How to Create, Advertise and Market eBooks, Streaming Videos and Audio Books by: Learn2succeed.com Incorporated: Softcover; 148 pages; ISBN: 978-1-55270-715-9 published in June 2014; $24.95.